Bangalore: After emerging as a trendsetter in wildlife tourism in the country, the State-owned Jungle Lodges and Resorts is now planning to start a scuba diving camp near the famous Netrani Island. A popular place for scuba diving in the country, the Netrani Island in the Arabian Sea is located about 10 nautical miles from Murudeshwar. A good destination for snorkelling and diving activities since it has a coral reef, the island boasts of a vast variety of aquatic and avian life. “We will set up a nature camp at Apsarkonda, near Honnavar, which will act as a base camp for those coming for scuba diving,” Managing Director of JLR N.D. Tiwari, told The Hindu. Apsarakonda, incidentally, also has waterfalls also. The JLR is planning to provide tent accommodation with about 20 to 30 beds for those undertaking scuba diving. “Scuba diving groups would be roped in to operate diving camps,” he added. At present, the Indian Navy is using a portion of this small island for its target practise, which is being opposed by environmentalists stating that the coral reef, which is among the only few near a mainland, would be damaged. Only those with prior permission from the Indian Navy can access the island for scuba diving and snorkelling activities. With regard to the permission from the Indian Navy, Mr. Tiwari said they would initiate talks on this issue and were hopeful of getting the permission. The camp, he said, would commence in November. 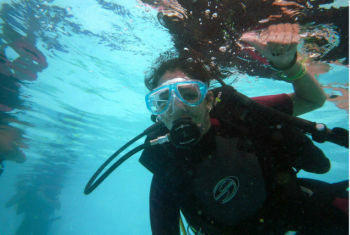 “There was a demand from the adventure enthusiasts for a scuba diving camp near the Netrani Island since it is the only place in mainland India where such opportunities can be provided.” At present, the Andaman and Nicobar Islands, and the Lakshadweep Islands offer opportunities for scuba diving, he said. On other projects, Mr. Tiwari said the black buck resort at Vilaspur near Bidar with a 15-cottage accommodation was ready for inauguration and 15-cottage resort at Talakalale near Jog Falls would be ready by May. As a OWD 18 metres marks the depth limit to which you’re qualified to dive. This limit isn’t arbitrary it’ based on no decompression limits, nitrogen narcosis an air supply but even if you’ve only made a few dives, you may be curious about deeper dives, perhaps simply to visit specific dive sites below 18 meters. The Deep Adventure dive will satisfy some of this curiosity and give you access to some of those dive sites by qualifying you to dive as deep as 30 meters, in conditions as good as or better than those in which you have training and experience. You can do your deep dive speciality on the up coming Maldives Dive Trip. Just sign up with us and get ready to explore the deeper side of Maldives. Soon to a blog near you. Well, which goes to say is this blog, but yes coming soon i will be putting up some dive specialities that one can learn and master, i will start with a few that you can do right away at our up and coming Maldives Trip. Stay tuned, Also leave a comment if you are looking for any particular specialties or want something particular to be highlighted (scuba diving related and NO! Girls in bikinis have nothing to do with scuba diving). Stay tuned avid divers.